ST. LOUIS, Missouri (CNN) -- Alaska Gov. Sarah Palin finished giving three hours of depositions Friday night to the state Personnel Board, which is looking into whether she unfairly fired Alaska's public safety director this summer, her attorney told CNN. Gov. Sarah Palin and her husband, Todd, are both to give depositions in the case. Palin, the Republican vice presidential candidate, gave her deposition in St. Louis. "The governor was very pleased to finally get the chance to get an opportunity to get the whole truth out to an unbiased and independent investigator," Palin attorney Thomas Van Flein said. Van Flein described Palin's testimony as detailed. 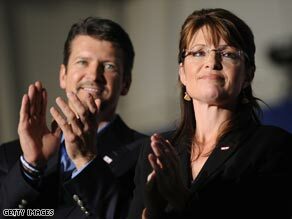 Her husband, Todd Palin, also was supposed to testify separately Friday but it was unclear if he had done so. Personnel Board investigator Timothy Petumenos took the governor's testimony. Walt Monegan, fired as public safety director in July, requested a fact-finding hearing before the state Personnel Board, saying his reputation had been "unjustifiably tarnished" by a false accusation of misconduct. Monegan, a gubernatorial appointee, said Palin fired him after he resisted pressure to sack State Trooper Mike Wooten, who had gone through an acrimonious divorce and custody battle with Palin's sister. The governor had asked the Personnel Board to conduct an investigation -- a move she launched after becoming Sen. John McCain's running mate, declaring the agency the proper legal venue for the investigation. Palin fought an earlier investigation that concluded she had unlawfully abused her power by pressuring Monegan to fire her ex-brother-in-law. The October 10 report, commissioned by the state Legislature, found Monegan's refusal to sack the trooper contributed to his own ouster -- but that dismissing him was within Palin's authority as governor. Despite those findings, Palin declared herself "cleared of any hint of unethical activity" by the Legislature's report. Van Flein said the Anchorage lawyer who wrote the report misinterpreted the state ethics law he accused her of breaking. Though Palin initially agreed to cooperate with the Legislature's investigation, campaign aides later declared it "tainted" by partisan politics. They argued that the Personnel Board was the proper legal venue for any investigation. The bipartisan legislative committee that commissioned the original investigation, however, has agreed to provide Petumenos with the results of its inquiry -- including an extensive, confidential section of the October 10 report that has not been publicly released. When asked if Petumenos indicated if he'd have a report completed before the November 3 regularly scheduled quarterly board meeting, Van Flein said: "Mr. Petumenos indicated he was working hard and diligently on this and would be as prompt as possible."